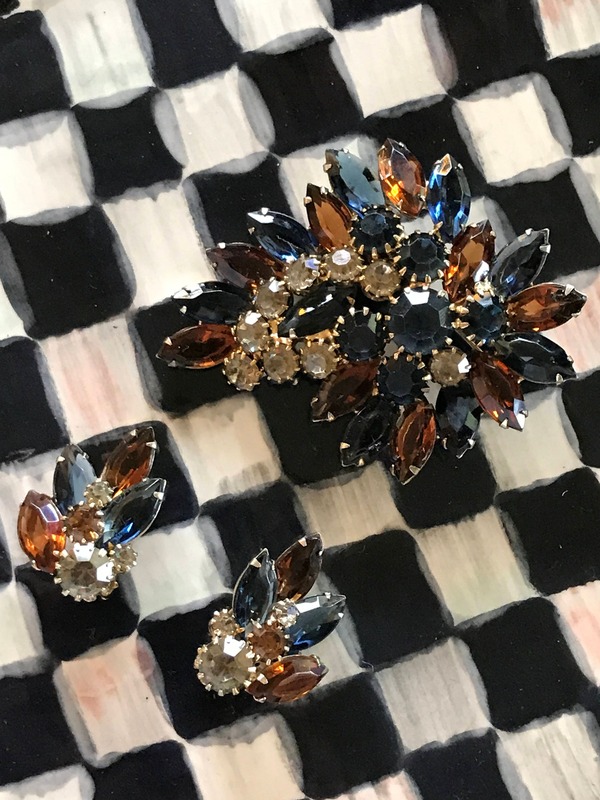 Weiss Vintage Juliana Style Rhinestone Brooch - circa 1960's. 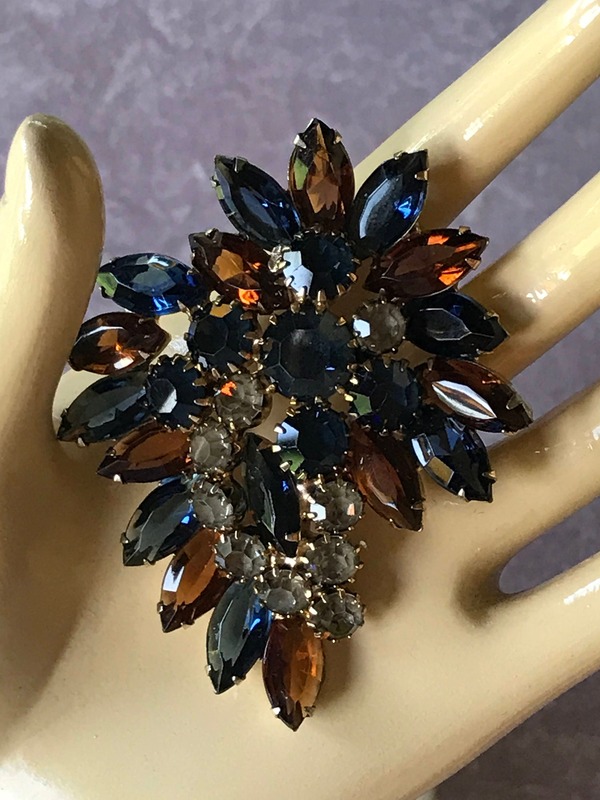 This brooch is in excellent vintage condition. 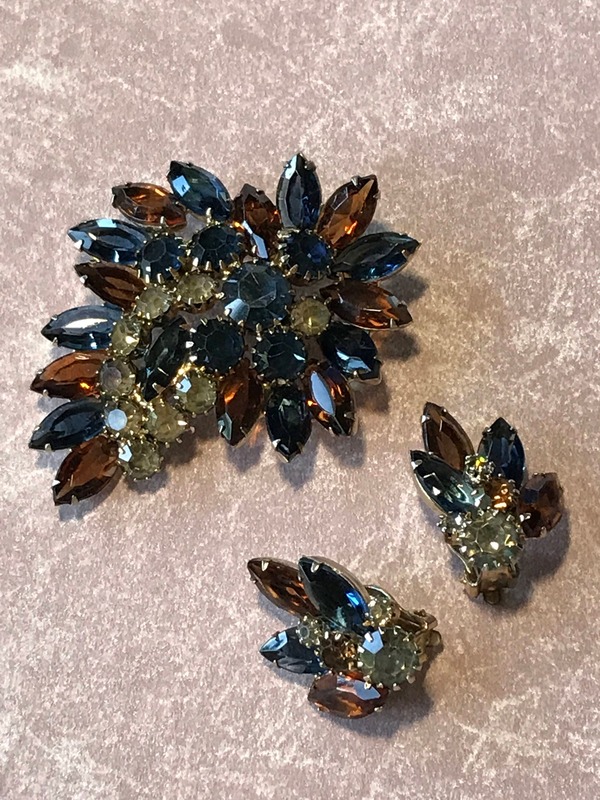 Beautiful Marquis shaped topaz and deep blue stones combined with beautiful chatons to creat this organic shape. 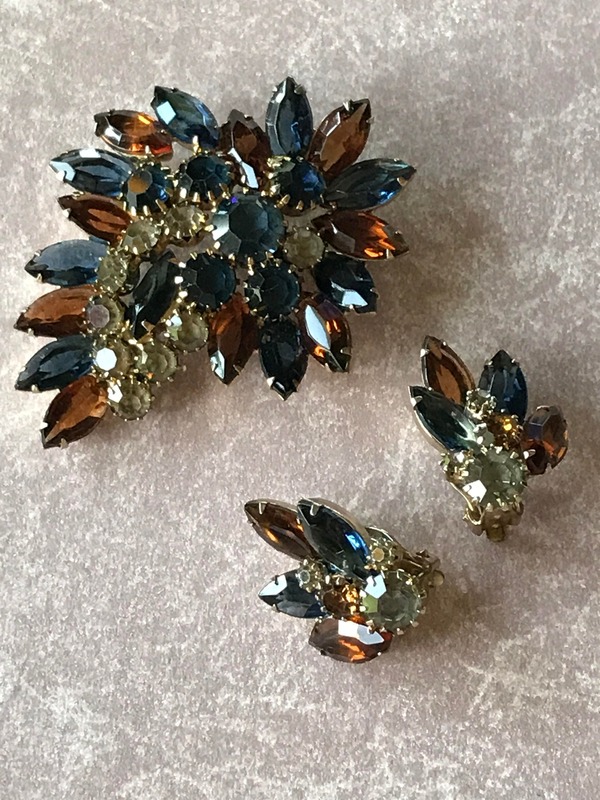 Brooch is 2 7/8 inches earrings 1.25 inches. All items shipped priority mail insured for full value. Payments Personal check, money order, or Direct Checkout. I can no longer accept Paypal as their return policy is inconsistent with my shop policy. If you wish to use PayPal, contact me directly my decision will be based upon prior purchase history or recommendation from another shop keeper. Layaway arrangements are all acceptable payment options. LAYAWAY ITEMS ARE NON RETURNABLE . Easiest most convenient for you will be to use Direct Checkout or contact me directly with your your credit card. All payments must be in US dollars and all payments must be made within ten (10) days of the order date. Items with pending payments including layaway orders will be marked with a HOLD tag on the site until payment is received and processed. If payment is not received within 10 days the order will be cancelled, notification of cancellation will be made via email and items returned to inventory. " Coupon Code discounted items are NOT eligible for return. Please make your selections carefully when purchasing with a coupon. If an item has been picked up from one of my shos 60 miles away a trip charge will be deducted from the sale price as I have spent a half day driving and fuel charges.
" Layaway terms are 25% down, non-refundable deposit, balance due within 60 days of order date and is available only on orders of $50.00 or more. Layaway items are not returnable. Upon receipt of final payment on a layaway the item will be shipped first class insured for the amount paid and shipping notification will be made to the buyer. Some items including lay away will require personal invoice from me. Please email me with you selection, and I will send you a discounted personal invoice. If you wish to use another form of payment, you must contact us first, for authorization. International orders are gladly accepted, however at the present time we are not accepting credit card orders for international orders. We reserve the right to refuse any order that does provide a valid, working email address or other verified shipping information. International Money Orders are accepted for international orders in the amount of purchase plus actual shipping charges. Upon clearance of said money order, you order will be shipped. " Layaway and Discounted or purchased with Coupon Codes are not eligible for return.
" Shipping Policy - All items will be shipped via USPS (US Postal Service) unless otherwise stated. First class USPS shipping is as posted in the United States on all Jewelry items. You may choose to have additional insured if so, you must email me so I can send you a new invoice including the insurance price.First $50 is included in the standard shipping. Any Other shipping method, please contact me directly. Paypal, credit cards and money orders ship within 1-2 days of payment clearance/receipt. Personal checks ship in 5-7 days, or less depending on previous purchase history. If you have a special shipping need, we will do our best to accommodate, please don't hesitate to contact me directly. International shipment costs are TBD (to be determined) and will be calculated once your order is received. We will email you with the shipping options and costs to your country. I only use FedX for some countries for reliability and tracking. Customs documents are filled out using the correct amount of purchase and description of the item. " I list 1-2 weeks shipping but it is usually within a week, my physical brick and mortar shop is 50 miles away so sometimes I have to make a trip to pick up an item from the shop and this adds to the shipping time. If you need an item right away, please convo me and I will try to get it shipped as quickly as possible. Discounted or purchased with Coupon Codes are not eligible for return. We want you to be happy with your purchase so please be sure to read all descriptions and size and condition info. All items are original and unrestored unless otherwise stated. Professional restorations will be noted in descriptions. Refunds WILL NOT be issued if items are returned without prior authorization or returned without following stated guidelines. Items returned in different condition than originally shipped will not not be accepted and refund will not be issued. Please do not hesitate to contact us with any questions about any item, we want you to be happy with your purchases Please note: We are not responsible for shipping damage or loss. Items which are insured and arrive damaged or are lost will be handled via claim with the US postal service. We are not responsible for uninsured or underinsured items, and can not to be held responsible for items which are delayed, lost or damaged by the post office or any other shipper. Please do not hesitate to contact us with any questions about this policy, your satisfaction guarantees you will shop with us again! " If an item has already been picked up from my shop 60 miles away a trip charge will be deducted from the sale price as I have spent a half day driving and fuel charges. Items that have been placed on layaway. Please read descriptions carefully and ask questions. DISCOUNTED OR ON SALE OR COUPON PURCHASES ARE NOT ELIGIBLE FOR RETURN. SOME SPECIAL LISTINGS ARE NOT ELIGIBLE FOR RETURN.
" Condition Definitions Excellent = Almost new condition, no noticeable flaws, dull, dark or yellow stones, virtually no plating or enamel loss. Sometimes this will be listed as "pristine condition" Very good = some minor signs of wear or age i.e. slight wear to plate or enamel, minor foil damage possible on a couple of stones, etc. Flaws will be minor. Specifics will be pointed out in the description. Good = signs of wear and age, specifics will be pointed out in description. Noticeable plating and/or enamel loss, copper may have some scratching, original patination is gone, some dull or graying stones. 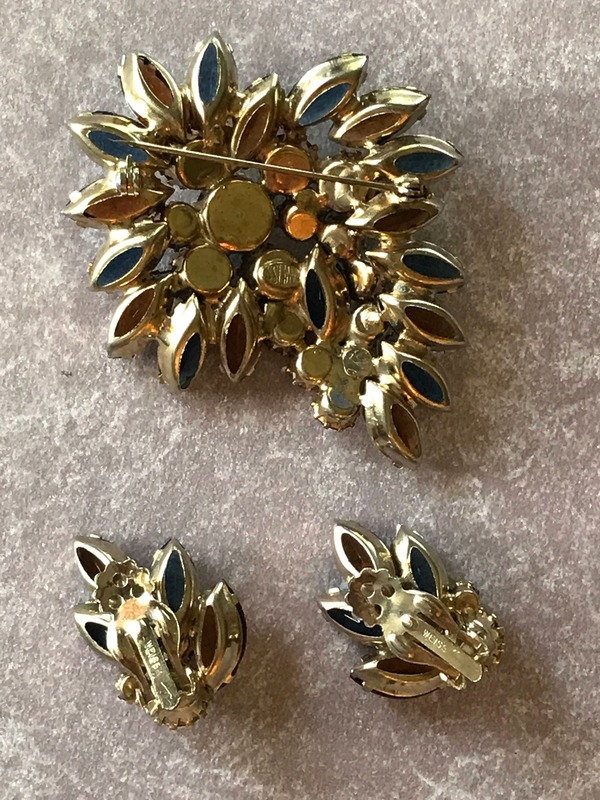 Fair = major condition problems, broken pin stems, serious wear, plating is gone, loose hinges,, deterioration of stones probably not in desirable wearable condition. Please do not hesitate to contact us regarding specific conditions or color questions. Unless otherwise stated, we make every effort to ensure that colors represented on the page are accurate. Additional views of items can be sent within 24 hours if needed to make a purchasing decision.